Docent-guided tours of the interior of the Lighthouse are offered on Sunday afternoons in the summertime from Memorial Day weekend to Labor Day weekend from noon to 3PM. Tours are approximately 30-minutes, which includes an overview of the history of the Lighthouse, perusal of the museum, and a view from the tower. There is also the option of watching a 20-minute documentary video detailing the dramatic reconstruction of the Lighthouse. 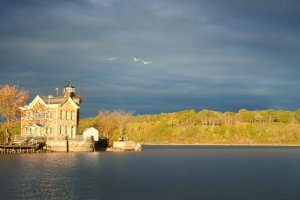 The small museum inside displays images and artifacts of the original Lighthouse and the commercial heyday of the Saugerties waterfront.